You must be a member of the Izmir Day Trips & Sports Activities Group to attend this activity. Would you like to join this group? We will be repeating the Palandöken ski trip we did in January!! This time we stay a full week, leaving on March 3rd and returning on March 11th. I will be staying in Protected content this time. 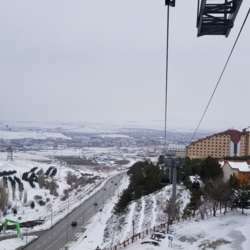 You can pick from a variety of hotels in Erzurum. Most of the ski resort hotels are within walking distance from one another. You may decide considering your preferences and your budget. I also bought flight tickets from Sunexpress. There is a direct flight from Izmir to Erzurum on March 3rd (Sunday morning at 10.00 am) and the return flight on March 11th (Monday evening at 7.30 pm). You can feel free to pick another flight connecting from Istanbul. Or you may choose to stay a few days more or a couple of days less.. In any case, it will be fun to spend some time skiing together. If you wish to attend, please do contact me as soon as you can so that I can help you with flight and accommodation.